You have a spectator choose a card out of the deck and slide it into the middle. You then shuffle the deck and say, "I'm going to use static electricity to make your chosen card rise up out of the deck". Then like magic the card rises and the spectator is amazed. O.K. so here's the secret to the levitating card trick. There is no preperation required. All you need is a regular deck of cards. When the spectator chooses a card cut the deck and have him/her place it in the middle. When you place the top half of the deck down you use a pinkie cut to keep their card in that spot. Then cut the deck again so that their card is on top of the deck. Shuffle the deck carefully so their card stays on top. Then you say, "I'm going to use static electricity to make your card rise out of the deck". 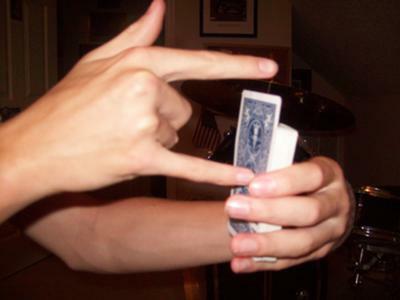 Rub your pointer finger against your sleeve and try to make the card "rise" out of the deck. After a few failed attempts you put your pinkie against the card (shown in the picture above) and push it up so it looks like the card is rising out of the deck. Make sure the spectator doesn't see your pinkie. Hope you enjoy the trick.